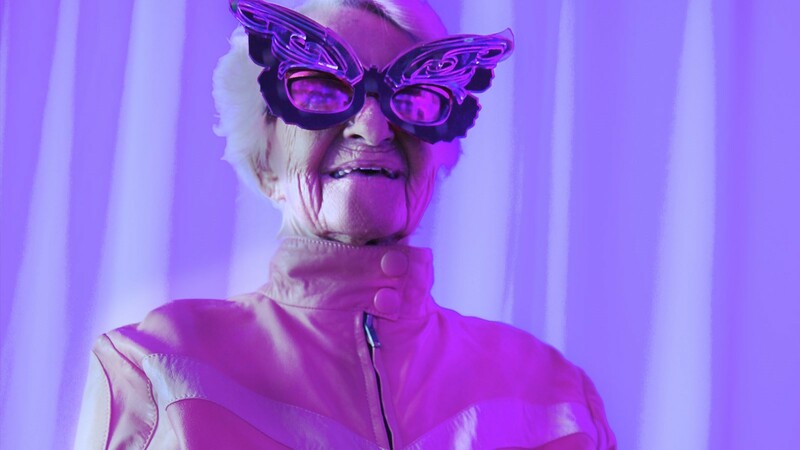 A pensioner with a penchant for streetwear, Instagram sensation Baddie Winkle might look like a novelty act on paper – or rather, on screen – but underneath the cloak of Instagratification, there is a human being with a hidden message. One year on from her social media debut, Winkle is everywhere. With more than 1.7 million followers, she’s transformed herself to become an international fixture of pop culture and an unlikely fashion muse. I’ve always been interested in the idea that we can live out multiple lives and identities within one body, and after having the opportunity to spend a few hours with Ms Helen Van ‘Baddie’ Winkle, I’m convinced that this inspiring and enigmatic woman’s purpose carries far greater weight than that of your average meme. The Baddie Winkle identity speaks more to the power of overcoming stale ageist expectations than it does to promoting the latest streetwear brand. With the curatorial guidance of her great-granddaughter, 19-year-old Kennedy Lewis, Winkle has made use of a unique, reverse-mentor/protege dynamic to craft a funny, irreverent persona. Upon entering the pair’s Universal City hotel room to conduct our interview, I find the two women unwinding from a long week of photo and TV shoots. Kennedy is stoned in a sea of colourful, one-of-a-kind garments strewn around the room, while Winkle has cosied up in bed with a John Grisham novel and a miniature raspberry cheesecake. Baddie appears to be off-duty, while Helen gets on with more typical grandma activities (although your gran probably wouldn’t be wearing a sweatshirt adorned with Tupac and Lisa Frank illustrations). I find myself wondering if Baddie has burned herself out trying to keep up with her great-granddaughter amid the swarm of media attention, but after five minutes in her company, it seems quite the opposite. American society perpetuates the idea of youth being one of the most valuable and coveted aspects of identity. You spend the first 25 years basking in the glow of ‘the best years of your life’, only to slog through the remainder of your years feeling like your glory days are over. Every new wrinkle signifies an increasing irrelevance within the eyes of the zeitgeist, and we’re encouraged to succumb to an idea that we are no longer as fresh, beautiful, or interesting as our younger selves. This is especially true for women, who are considered ‘damaged goods’ by the time they’re pushing 30. The Baddie Winkle mythos seeks to combat this mentality through self-actualisation. Try as we might to reduce her to a mere novelty act, there’s much more to Winkle than slinging streetwear and posing for Instagram likes. It’s refreshing to see someone have fun and free themselves from the limits of age, and what could be more youthful than rebelling against societal expectations? Signe Pierce: I know that the Baddie alter-ego was born out of Kennedy coming home and seeing you in some cut-offs looking cute. Do you feel like you were in touch with this side of yourself before you and Kennedy started curating the persona? Baddie Winkle: No, not really. Signe Pierce: What inspired it? Baddie Winkle: I just wanted to lay out in the sun and put on her shorts and shirt. I didn’t know what Twitter was. I heard about it on TV. ‘Twitter’ this, ‘Twitter’ that. She suggested that we put it on Twitter, so we did. Signe Pierce: And how quickly did it take off? Kennedy Lewis: You know all of those accounts on Twitter like Childhood Ruiner, etc? After we posted the photo all of those meme accounts reposted the picture with the caption, ‘When a white girl smokes weed one time.’ So that post made it happen, literally just within the first hour. Signe Pierce: Did you have a lot of followers to begin with? Baddie Winkle: So we went with Baddie and added Winkle at the end. Signe Pierce: Let’s talk about haters. Anyone who finds themselves being turned into a meme has to deal with them. Can you tell us about the process? How you felt in the beginning, to becoming an overnight sensation, to the backlash, and now? Signe Pierce: Haters hate themselves. Baddie Winkle: We call them basics and we pray for the basics. Kennedy Lewis: Yesterday someone commented, saying ‘I’m genuinely upset that you aren’t dead yet.’ Someone said that! I said, ‘Grandma, this is insane... Do you want to respond to it?’ Because this really isn’t cool. She told me to tell them to get a life. I responded and said something but ended up deleting it. The word ‘genuine’ was just sad – it’s just such a heartfelt word. Like, you’re genuinely upset? Really? Baddie Winkle: Hate is kind of stupid really. Signe Pierce: How do you feel now? How long has this been going on? Kennedy Lewis: It happened last April so about a year and a half. Baddie Winkle: It’s changed my life completely. Baddie Winkle: Kennedy is kind of shy, and I’ve never been shy. People are just people, they don’t intimidate me. I don’t think the president could intimidate me. Signe Pierce: Has this past year ever gotten overwhelming? Do you want it to slow down? Kennedy Lewis: It’s been like that for me. Kennedy Lewis: We will be travelling so much and we just won’t get any free time. It’s overwhelming because I don’t have time for myself, and she doesn’t have time for herself, but I think she likes to stay busy. Baddie Winkle: Well, I like to have two to three hours every day to relax. Kennedy Lewis: It gets so crazy sometimes. Signe Pierce: Do you work every single day? Kennedy Lewis: On the weekend I turn my phone off because I don’t want to deal with any of it. Signe Pierce: I have a somewhat political question – do you consider yourself a feminist? Baddie Winkle: Oh yeah. Oh yeah. Signe Pierce:: What does it mean to you? Baddie Winkle: Well, I have a lot of fun with all of this and I hope to inspire people to get out and do the things they want to do. Maybe you’d like to dress up in a funky outfit. If you do, just go on. Go for it. If you tell me I can’t do it, I will do it. Signe Pierce: What about friends your age? What do they think? Baddie Winkle: I think it’s funny. Signe Pierce: What has been the most exciting aspect of your ride as Baddie Winkle? Baddie Winkle: I think the most exciting thing I’ve done is meeting Miley Cyrus. Very cool, down-to-earth kid. You wouldn’t think that she was a famous singer, she doesn’t act like that. She just acts like any regular old person. She gets a little wild with what she wears, and that’s fine, that’s Miley. She had to change herself from being Hannah Montana. She was a child then. Signe Pierce: And that persona was also sort of forced on to her by the studios. She had to evolve and change to become a real person. Baddie Winkle: So she did! She changed drastically. Baddie Winkle: No, she didn’t change inside. She just grew into herself. Signe Pierce: What would you say is your philosophy? Baddie Winkle: I guess to live your life every day and don’t look back, look forward. No matter how much you want to, you cannot change the past. Kennedy Lewis: My mum worked at a nursing home and she said that the number one thing that people regret on their deathbeds is not doing what they really wanted to. I think Baddie’s doing everything she wants to. Signe Pierce: What does the future look like for you? Kennedy Lewis: I think we’re gonna be doing a reality show. MTV asked our producer to have a meeting with them today about our show which was really bittersweet, I don’t know how to feel about that at all. We’ve done some of the reality-show thing and it’s a lot of work. You film five days a week, six or seven hours a day, for four weeks. We shot a pilot, parted ways with that producer, and now we have a new producer. That’s the next thing we’re about to embark on. Signe Pierce: A reality show will take over your entire life. Kennedy Lewis: I know, and that’s really scary. Signe Pierce: Do you have any apprehensions? The thing about reality TV is you leave your real life behind. Kennedy Lewis: It will be cool, they’re going to follow us everywhere . Signe Pierce: How do you feel about it, Baddie? Baddie Winkle: I’m really doing this for my grandchildren and great grandchildren. I feel very comfortable with it. I feel like I’m at the end of my life. That’s just the reality of it. I’m old. And I know I’m old, but I don’t feel old. But once it starts, these kids can carry on with it, even though I wouldn’t be there. And I would just love to just make an appearance once in a while. Signe Pierce: A cameo? I hate to break it to you babe, but you’re the star.